Kyaddondo East MP Robert Kyagulanyi aka Bobi Wine. File photo. 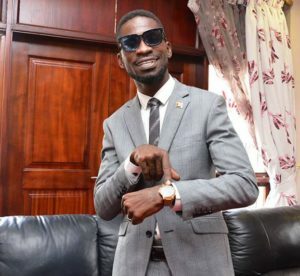 A number of musicians under the Save Uganda Music group are not happy with singer-turned politician, Robert Kyagulanyi Ssentamua.k.aBobi Wine over his exit from the Save Uganda Music, WhatsApp group. Bobi Wine quit the group earlier this week, according to our snoop. The Kyadondo East legislator did not give a reason why he left the group. The members have since then been spitting venom over his move. Most of them say he thinks he is better than them, thanks to his new earned status as a Member of Parliament. The purpose of the group is, among other things, to earn airplay dominance on local television channels. Under the group, they discuss ideas on how they can achieve their goals, but it seems some artistes disagree with ideas put across. Recently, the musicians had vowed to boycott NTV Uganda and other channels. Bebe Cool also left the group.